You ever play that one instant or sorcery spell a little too early? 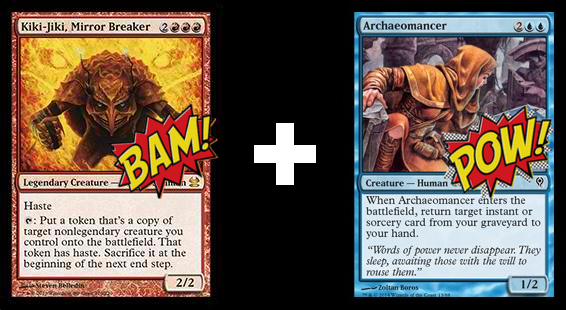 Here’s a great combo to get it back in your hand later in the game when you’re wishing you hadn’t cast it so early. Playing a RUG deck? Why not add Seedborn Muse, Prophet of Kruphix, or Quest for Renewal for extra freaky Kiki-Jiki tweaking? This is a good way to copy your own instant or sorcery (how about an Epic Experiment?). You can even surprise an opponent by copying one of their powerful spells to give you the edge. To be extra devious, copy counterspells and fizzle a friend’s fun. Yes, yes, this is legal. 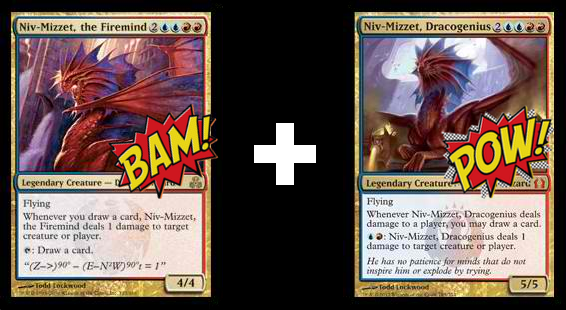 Our friend Niv-Mizzet has two different titles in his two card names, so these legendary bros can play together. This move is no Niv-Mizzet/Curiosity tomfoolery, but there is a bit of play between these two historical versions of everybody’s favorite dragon wizard. By activating Niv-Mizzet, Dragogenius’ 1-damage ability, he’ll of course draw you a card–but you’ll also earn a second point of damage from his buddy the Firemind’s triggered ability. That means you can conjure twice the fire with Dracogenius’ mana-sink ability. So there you have it! Three one-two punches you can try pulling on your friends in your Blue-red deck. 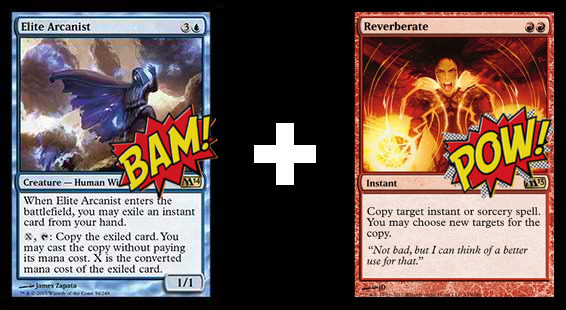 What are your favorite one-two punches in the land of Izzet? Let me know in the comments section below.